Tempus Fugit: You Smell Just Like a Tourbillon! You Smell Just Like a Tourbillon! Because there are some things that you just couldn't make up, there is now a perfume to cover the smell of disbelief and bewilderment. Franck Muller is now, apparently, in the fragrance business. 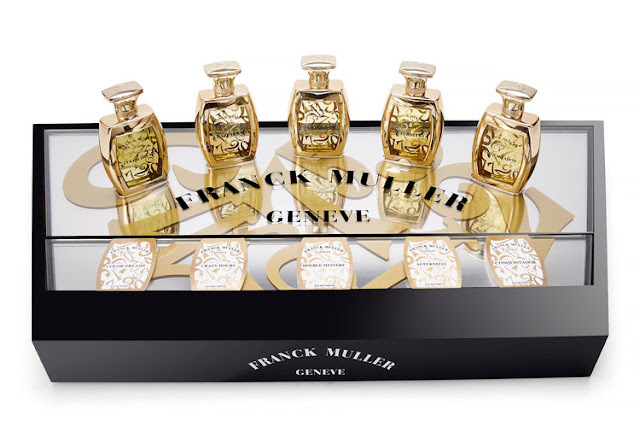 And if that was not goofy enough, they are not offering just one, but rather several different scents that are all, apparently, connected to different members of the Franck Muller collection. When master watchmakers meet master perfumers, both accustomed to working with complexity and precision, combined with beauty and fascination, the outcome will immerse you in a rich sensory world with perfect balance. The brand decided to broaden its reach with a fine fragrance collection created in partnership with some of CPL Aromas’ top perfumers Beverley Bayne, Julie Pluchet and Dominique Preyssas. The creative team met in Monaco to explore the worlds of watchmaking and perfumery, discovering similarities and shared passions. The result is a translation of the art of horology into five fine fragrances. And no watch fans, this is not April Fools. This is apparently very, very real. So I am guessing that this perfume is meant to be the "antidote" to combat the watch geek's unquenchable thirst for haute horology. Simply dab a bit of "Crazy Hours" behind your ears and that watch geek will forget all about watches, and think only of you!